CD4+ Th1 cells play a critical role in orchestrating host defense against pathogens and in the pathogenesis of many immune-mediated diseases. The control of Th1 cell trafficking into sites of infection and inflammation is an important determinant of Th1 cell function. We have previously shown that trafficking of adoptively transferred Ag-specific Th1 cells into the lung following airway Ag challenge depends on CXCR3 expression on Th1 cells and STAT1-inducible CXCR3 ligands in the lung. In this study, we show that LPS alters the mechanisms of Th1 cell recruitment. After a single intranasal dose of LPS, trafficking of adoptively transferred Ag-specific Th1 cell into the lung in response to airway Ag challenges was no longer dependent on CXCR3 and its ligands and instead was mediated through additional Gαi-coupled chemoattractant receptor pathways, including CCR5. In addition, LPS markedly increased the magnitude of Ag-specific Th1 cell homing into the airways following airway Ag challenges. The increased trafficking of Ag-activated Th1 cells, in turn, dramatically amplified LPS-induced airway neutrophilic infiltration by maintaining high levels of the neutrophil active chemokines, KC and MIP-2, through an IFN-γ dependent mechanism. Therefore, LPS increases Ag-specific Th1 cell trafficking into the airways and Ag-specific Th1 cells amplify the airway neutrophilic inflammatory response initiated by LPS. This reciprocal interaction between LPS and Ag-activated Th1 cells represents a collaborative connection between the innate and adaptive arms of the immune system. Th1 cells are a specialized subset of effector CD4+ Th cells that, upon Ag stimulation, secrete IFN-γ, a potent cytokine that influences a wide range of immunologic responses aimed at protecting the host against invading pathogens. IFN-γ decreases neutrophil apoptosis, increases MHC class I and II expression on APCs, induces chemokine production to attract more inflammatory cells, up-regulates microbicidal activity of macrophages and neutrophils, and promotes IgG2a class switching (1, 2). The prominent role of IFN-γ in host defense explains why Th1 cells are critical in the eradication of many pathogens, including Listeria, Toxoplasma, Mycobacteria, Salmonella, and many viruses (3, 4, 5, 6, 7, 8, 9, 10, 11, 12, 13, 14, 15, 16, 17, 18, 19, 20). Th1 cells also participate in the pathogenesis of a wide variety of inflammatory disorders, including psoriasis (21), chronic graft vs host disease (22), and transplant rejection (23). An important determinant of Th1 cell function is the ability of Th1 cells to home to sites of infection and inflammation where they orchestrate local host defenses and Th1-type inflammatory responses. We have previously shown that Th1 cell trafficking in vivo relies on CXCR3 expression on Th1 cells and tissue expression of STAT1-regulated CXCR3 ligands as STAT1−/− mice that fail to express CXCL9, CXCL10, and CXCL11 do not recruit Ag-specific Th1 cells efficiently into their lung and airways following airway Ag challenges (24). More recently, we unexpectedly noted that STAT1−/− mice, inadvertently infected with the pulmonary pathogen Pasteurella pneumotropica, were able to recruit Ag-specific Th1 cells into the lung. Because Pasteurella pneumotropica is a Gram-negative bacteria and its cell wall contains LPS, we asked whether we could recapitulate our experience with Pasteurella pneumotropica using LPS. We observed that adoptively transferred Ag-specific Th1 cells trafficked normally in STAT1−/− mice that had been treated with one intranasal dose of LPS before aerosolized Ag challenges. In contrast, Ag-specific Th1 cells continued to have a trafficking defect in uninfected STAT1−/− mice that had not been treated with LPS before airway Ag exposure. The observation that Th1 cell trafficking differed whether STAT1−/− mice were given LPS or not indicated that LPS alters the mechanisms of Th1 cell trafficking. Therefore, in this study, we set out to delineate the impact of LPS on Ag-specific Th1 cell trafficking in vivo. OTII mice, which are transgenic for the TCR recognizing OVA peptide 323–339 (pOVA323–39) and are in the C57BL/6 background, were a gift from Protul Shrikant (Roswell Park Cancer Institute, Buffalo, NY) (Thy1.1+) and Leo Lefrancois (University of Connecticut Health Center School of Medicine, Farmington, CT) (Thy1.2+). CXCR3−/− mice (25) and CCR5−/− mice (26) were generated as described and backcrossed into the C57BL/6 background. To generate CXCR3−/−CCR5−/− mice, CXCR3−/− female and CCR5−/− male mice were bred to each other in our facility. F1 offspring (CXCR3−/−CCR5+/− males and CXCR3+/−CCR5+/− females) were then bred to each other to generate mice deficient in both CXCR3 and CCR5. CXCR3−/− OTII mice were generated by breeding female CXCR3−/− mice with male OTII mice. To generate CCR5−/−OTII mice, female CCR5−/− mice were bred with male OTII mice. The males from the F1 generation (CCR5+/−OTII) were bred with female CCR5−/− mice and male CCR5−/−OTII mice in the F2 generation were identified. To generate CXCR3−/−CCR5−/−OTII mice, female CXCR3−/−CCR5−/− mice were bred with male CCR5−/− OTII mice. CXCR3 and CCR5 deficiencies were confirmed by PCR for all mouse lines. STAT1−/− mice, in the BALB/c background, were generated as described (12) and bred at Charles River Laboratories. DO11.10 mice, also in the BALB/c background and transgenic for the TCR recognizing pOVA323–39, were purchased from The Jackson Laboratory and bred in our animal facility. Wild-type Thy1.2+ C57BL/6 mice, Thy1.1+ C57BL/6 mice, and BALB/c mice, used as recipient mice, were purchased from The Jackson Laboratory. Thy1.1+ C57BL/6 mice were subsequently bred in our animal facility. IFN-γ receptor 1 deficient mice (IFN-γR1−/−) and CCR5−/− mice, both in the C57BL/6 background, were also purchased from The Jackson Laboratory. Mice were age and gender matched and used at 6 to 8 wk of age. All experiments were done according to protocols approved by the Massachusetts General Hospital Subcommittee on Research Animal Care. Th1 cells were generated as described previously (24). In brief, CD4+ T cells were isolated from the spleen and pooled lymph nodes of OTII or DO11.10 mice using CD4 Dynabeads (Dynal). Purified CD4+ T cells (5 × 105 cells/ml) were activated in the presence of irradiated (3,000 rads) splenocytes (2 × 106 cells/ml), 1.5 μg/ml pOVA323–339, and 1.5 μg/ml anti-CD28 (BD Pharmingen) in a 24-well plate. Th1 cells were generated by activating the cells in the presence of 100 U/ml IL-12 (PeproTech) and anti-IL-4 (11B11 or BD Phamingen) at inhibitory concentrations. Cells were fed with IL-2 (PeproTech, 5–10 U/ml) initially on day 2 and then daily until used between days 5–7. Aliquots of cells (0.25 × 106 cells) were stimulated with PMA (50 ng/ml) and ionomycin (500 ng/ml) (Sigma-Aldrich) at 37°C for 1 h. Protein transport was inhibited by using GolgiStop (BD Biosciences) at 1.3ul/ml at 37°C for 3 h. Cells were washed and nonspecific staining was minimized by blocking with anti-mouse CD16/CD32 (BD Pharmingen) for 10 min on ice. The cells were washed and permeablized with Fix and Perm fixation medium A and B (Caltag Laboratories) and stained intracellularly with rat anti-mouse IL-4 (PE, BD Pharmingen), or IL-17A (PE, eBioscience), and IFN-γ (FITC or allophycoerythrin, BD Pharmingen) and isotype controls. The level of intracellular cytokine staining was determined by flow cytometry to assess the degree of Th1 polarization. Th1 cells were harvested on days 5–7, washed twice with PBS, and 5 × 106 cells per mouse were injected i.v. via the tail vein into naive Thy1.2+ C57BL/6, Thy1.1+ C57BL/6, IFN-γR1−/− C57BL/6, STAT1+/+ BALB/c, or STAT1−/− BALB/c mice depending on the experiment. After the adoptive transfer, mice were given either LPS at 5 μg per 50 μl of PBS or 50 μl of PBS intranasally under light sedation using Isoflurane. Some mice were given only LPS without the adoptive transfer of Th1 cells. Recipient mice were either challenged once a day (20 min/day) with 5% OVA solution using a nebulizer (Pulmo Aide; DeVil Biss) or were not challenged with OVA. In separate experiments, in vitro-generated Th1 cells were collected on day 5, resuspended at 4 × 105 cells/ml, and treated with pertussis toxin (PTX)3 (Sigma-Aldrich, 100 ng/ml) or vehicle (distilled H2O) for 24 h. Cells were washed twice with PBS. Five million PTX treated or PTX untreated cells per mouse were adoptively transferred via the tail vein into separate naive mice that were then given an intranasal dose of LPS and challenged with aerosolized OVA as above for 3 days. In some experiments, BALB/c recipient mice were injected i.p. with 200 μl of BrdU (Sigma-Aldrich) at 10 mg/ml immediately before the second OVA challenge corresponding to 24 h after the dose of LPS. Commercially available OVA (Sigma-Aldrich) at 1 μg/ml and LPS (Sigma-Aldrich) at 1 μg/ml were prepared. Both were serially diluted in PBS. Samples were added to the tubes from the Limulus assay kit (Charles River Endosafe). The solution was gently mixed and incubated at 37°C for 1 h and assessed for coagulation. BAL was performed 20–24 h after the final aerosol challenge with six 0.5-ml aliquots of PBS with 0.6 mM EDTA. Lungs were cut into small pieces and digested in RPMI 1640 medium + 0.28 Wunsch U/ml Liberase Blenzyme (Roche) and 30 U/ml DNase (Sigma-Aldrich) for 45 min at 37°C. Single cell suspensions were made from thoracic lymph nodes (TLN), spleen and digested lungs after passage through a 70-micron cell strainer (Fisher). Recovered cells were lysed with RBC lysis buffer (Sigma-Aldrich) and washed. Live cells were counted with a hemocytometer. Differential cell counts were determined using Diff-Quik stained cytocentrifuged cell preparations from BAL by counting three high power fields per sample. Total RNA was isolated from lung samples using RNeasy (Qiagen). RNA was converted to cDNA and analyzed by QPCR as previously described (27) using the Mx4000 Multiplex Quantitative PCR System (Stratagene). Cell suspensions from BAL, lung, TLN, and spleen were analyzed by flow cytometry on a FACScan (BD Biosciences) cytofluoremeter as described previously (28). For experiments using OTII mice, anti-mouse Abs to CD4 (allophycoerythrin; BD Pharmingen), Thy1.1 (PerCP, BD Pharmingen) and Thy1.2 (FITC, BD Pharmingen) were used. To determine the number of OVA-specific Th cells, the total number of cells was multiplied by the percentage of CD4+Thy1.1+ cells in experiments using the adoptive transfer of Thy1.1+ OTII cells or the total number of cells was multiplied by the percentage of CD4+Thy1.2+ cells in experiments using the adoptive transfer of Thy1.2+ OTII or chemokine receptor deficient Thy1.2+ OTII cells. For experiments involving the adoptive transfer of Th1 cells generated from DO11.10 transgenic mice into wild-type STAT1+/+ BALB/c and STAT1−/− BALB/c mice, anti-mouse Abs to CD4 (allophycoerythrin or FITC, BD Pharmingen) and to the mouse DO11.10 transgenic TCR, KJ1–26, (PE, Caltag Biochemicals) were used. To determine the number of OVA-specific Th cells, the total number of cells was multiplied by the percentage of CD4+ KJ1–26+ cells. For neutrophil staining, anti-mouse Ab to Ly6G (PE, 1A8, BD Pharmingen) was used and Ly6G staining was determined in the neutrophil gate. To determine the total number of neutrophils, total BAL cell count was multiplied by the percentage of Ly6G+ cells. To determine the number of proliferating OVA-specific Th cells in the TLN, surface staining was performed as described above using Abs for CD4 (FITC) and KJ1–26 (PE) followed by BrdU staining using allophycoerythrin-conjugated anti-BrdU Ab (APC BrdU Flow kit, BD Pharmingen) as per manufacturer’s protocol. The total number of cells in the TLN was multiplied by the percent of BrdU+CD4+KJ+ cells. CCL3, CCL4, and KC levels were measured in 1 ml BAL supernatants by ELISA according to the manufacturer’s instructions (R&D Systems, DuoSet). For histologic assessment, the chest was opened, the trachea was cannulated, and the lungs were maximally inflated with 10% formalin. The lungs were removed from the thoracic cavity and placed in 10% formalin. Multiple paraffin embedded 5-μm sections were prepared and stained with H&E. All experiments were performed at least twice with a minimum of three mice per group per experiment. Comparisons were analyzed by a two-tailed Student’s t test using Microsoft Excel software for Statistical significance. p < 0.05 was considered significant. We have previously shown that trafficking of adoptively transferred Ag-specific Th1 cells into the lung following Ag challenges is STAT1 and CXCR3 dependent (24). To determine whether STAT1 continues to regulate Ag-specific Th1 cell trafficking when exposure to Ag occurs in the context of LPS, we generated OVA-specific Th1 cells in vitro from DO11.10 mice, which are transgenic for the TCR recognizing pOVA323–39 and are in the BALB/c background. OVA-specific Th1 cells were generated in vitro using pOVA323–339, IL-12, and anti-IL-4. After 6 days of culture, cells were shown to produce IFN-γ, and not IL-4 or IL-17 (supplementary Fig. 1a).4 We transferred OVA-specific wild-type Th1 cells into STAT1+/+ wild-type (WT) and STAT1−/− mice, all in the BALB/c background, by tail vein injection. WT and STAT1−/− mice were divided into two groups each. One group received a dose of intranasal PBS (50 μl) (Th1 + OVA), while the other group received a dose of intranasal LPS (5 μg in 50 μl of PBS) (Th1 + LPS + OVA). All mice were given three daily aerosolized OVA challenges. Twenty-four hours after the last OVA challenge, the BAL was harvested and OVA-specific T cells were identified using the clonotypic Ab, KJ1–26, to the mouse D011.10 TCR. Consistent with our previous report (24), OVA-specific Th1 cell trafficking into the airway was diminished by 2.6-fold in STAT1−/− mice compared with WT mice when mice were given only OVA-specific Th1 cells and three daily OVA challenges (Fig. 1⇓a; WT Th1 + OVA vs STAT1−/− Th1 + OVA). 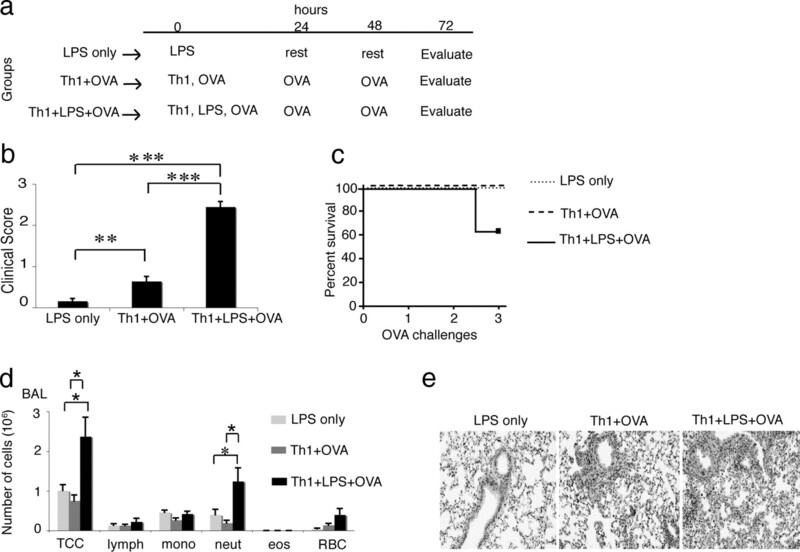 However, when mice were given an intranasal dose of LPS before the adoptive transfer of OVA-specific Th1 cells and three daily OVA challenges, the number of OVA-specific Th1 cells increased in the airway by 3-fold and there was no difference in the recruitment of OVA-specific Th1 cells between WT and STAT1−/− mice (Fig. 1⇓a; WT Th1 + LPS + OVA vs STAT1−/− Th1 + LPS + OVA). 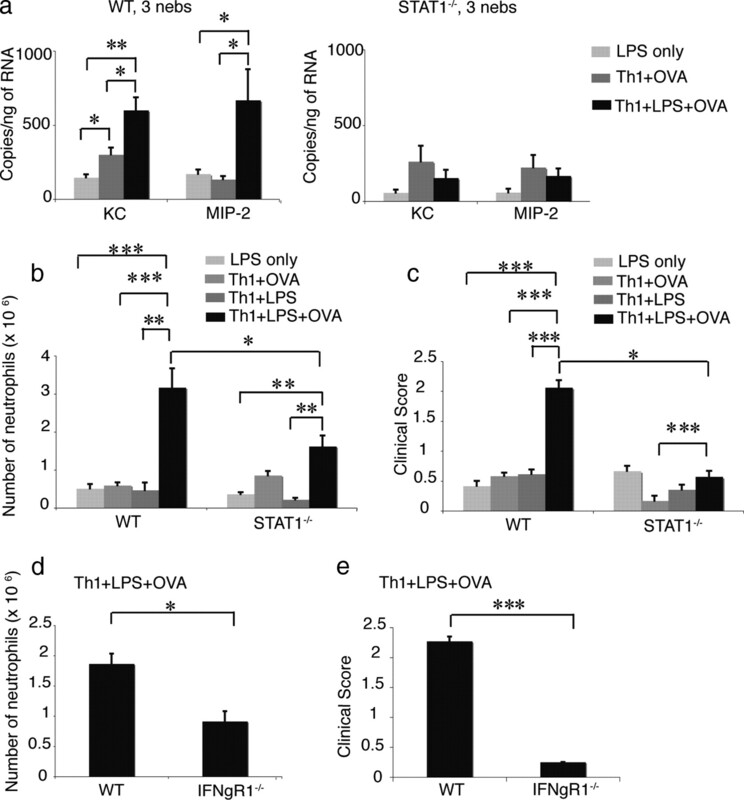 This result indicates that LPS increases the trafficking of OVA-specific Th1 cells into the airway and overrides the STAT1 control of Ag-specific Th1 cell trafficking in vivo. Ag-specific Th1 cell trafficking in the context of LPS is not dependent on STAT1 and CXCR3. a, DO11.10 Th1 cells were adoptively transferred into WT (STAT1+/+) and STAT1−/− mice that were given either an intranasal dose of PBS (Th1 + OVA) or an intranasal dose of LPS (Th1 + LPS + OVA) followed by three daily OVA aerosolized challenges. Twenty-four hours after the last OVA challenge, BAL was harvested. Number of Ag-specific T cells (CD4+KJ+) in the BAL. n = 8 in two separate experiments. *, p < 0.05. b, DO11.10 Th1 cells were adoptively transferred into WT mice that were given an intranasal dose of LPS with (Th1 + LPS + OVA) or without (Th1 + LPS) three daily OVA challenges. Twenty-four hours after the last challenge, BAL, lung, and TLN were harvested. Number of Ag-specific T cells (CD4+KJ+). n = 7–13 in two to three separate experiments. *, p < 0.05; ***, p < 0.0005. c, DO11.10 Th1 cells were adoptively transferred into WT mice that were given an intranasal dose of LPS with (Th1 + LPS + OVA) and without (Th1 + LPS) three daily OVA challenges. All recipient mice were injected with BrdU i.p. immediately before the second OVA challenge, which was 24 h after the dose of LPS. Twenty-four hours after the last OVA challenge, corresponding to 72 h after the dose of LPS, TLN was harvested and the number of Ag-specific T cells that had incorporated BrdU (BrdU+CD4+KJ+) was determined. n = 7–9 mice in two separate experiments. ***, p < 0.0005. d, Lung mRNA expression of CXCL9, CXCL10, and CXCL11 in WT vs STAT1−/− Th1 + LPS + OVA recipients. n = 6 mice in two separate experiments. **, p < 0.005. Because commercially available OVA contain endotoxin, we asked whether there is a difference in endotoxin levels between OVA and LPS. The endotoxin levels of two different lots of OVA (Sigma-Aldrich) and three different lots of LPS (Sigma-Aldrich) were measured. The endotoxin concentration in LPS was >4000-fold higher than that in OVA. LPS at 1 μg/ml contained 2250 ± 450 endotoxin units per ml, while OVA at 1 μg/ml contained 0.6 endotoxin units per ml (data not shown). These measurements show that although there is endotoxin contamination in OVA, the endotoxin levels in LPS are significantly higher than the endotoxin levels in OVA. We next addressed whether it was LPS alone or the combination of OVA and LPS that caused the increase in OVA-specific Th1 cell trafficking. DO11.10 Th1 cells were generated in vitro as described above. On day 7, DO11.10 Th1 cells were adoptively transferred via the tail vein into WT mice. One day after the adoptive transfer, the recipient mice were given an intranasal dose of LPS (5 μg in 50 μl of PBS) and were divided into two groups. One group received three daily aerosolized OVA challenges (Th1 + LPS + OVA) while the other group was not given OVA challenges (Th1 + LPS). Twenty-four hours after the last challenge, corresponding to 72 h after the dose of LPS, BAL, lung, and TLN were harvested and OVA-specific Th cells were identified as CD4+KJ+ cells. There was a 2.7- and 10.8-fold increase in the number of OVA-specific Th cells in the lung and TLN, respectively, in Th1 + LPS + OVA recipient mice compared with Th1 + LPS recipient mice (Fig. 1⇑b). The difference in the number of Ag-specific T cells in the BAL between Th1 + LPS + OVA and Th1 + LPS recipient mice did not reach statistical significance. We next examined the degree of OVA-specific Th cell proliferation caused by exposure to OVA. DO11.10 Th1 cells were generated in vitro and adoptively transferred via the tail vein into WT mice on day 7. One day after the adoptive transfer, the recipient mice were given an intranasal dose of LPS (5 μg in 50 μl of PBS) with (Th1 + LPS + OVA) or without (Th1 + LPS) three daily aerosolized OVA challenges as described above. All mice were given an i.p. injection of BrdU (2 mg per injection) immediately before the second OVA challenge, corresponding to 24 h after the dose of LPS. TLN was harvested 24 h after the last OVA challenge or 72 h after the dose of LPS. Proliferating Ag-specific T cells were identified as BrdU+CD4+KJ+. Th1 + LPS + OVA recipient mice had 20-fold more BrdU+CD4+KJ+ cells in their TLN compared with Th1 + LPS recipient mice (Fig. 1⇑c). Therefore, Ag exposure induces Ag-specific Th cell proliferation, and in combination with LPS, increases Ag-specific Th1 cell trafficking into the lung and the TLN. We next turned our attention to the mechanisms of Ag-specific Th1 cell trafficking following Ag exposure in the context of LPS. We speculated that the LPS-induced trafficking of Th1 cells in STAT1−/− mice could be explained by expression of CXCR3 ligands via a STAT1-independent, LPS-dependent mechanism. WT and STAT1−/− mice were injected with OVA-specific Th1 cells generated from DO11.10 mice as described above via the tail vein, and given an intranasal dose of LPS (5 μg in 50 μl of PBS), followed by three daily aerosolized OVA challenges (Th1 + LPS + OVA). Twenty-four hours after the third OVA challenge, lungs were harvested, and chemokine RNA levels were determined by QPCR. The expression of CXCR3 ligands, CXCL9, CXCL10, and CXCL11, was abolished in Th1 + LPS + OVA treated STAT1−/− mice compared with Th1 + LPS + OVA treated WT mice (Fig. 1⇑d). 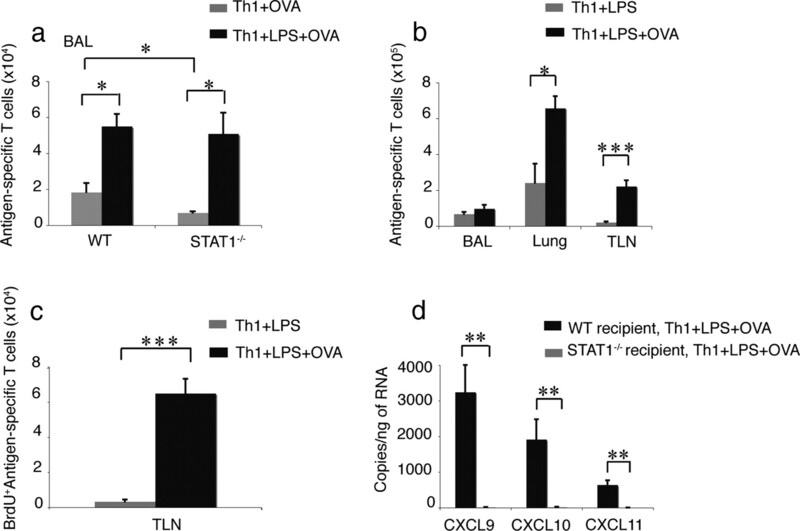 This result demonstrates that Th1 cell trafficking in the context of LPS occurs in STAT1−/− mice despite the lack of CXCR3 ligands. Therefore, CXCR3 and its ligands are dispensable for Th1 cell trafficking in the context of LPS. We have previously shown that Th1 cell trafficking is mediated by PTX sensitive chemoattractant receptors (24). PTX is an irreversible inhibitor of Gαi-coupled chemoattractant receptors and inhibits chemokine-induced chemotaxis. To determine whether Th1 cell trafficking in the context of LPS continues to depend on Gαi-coupled chemoattractant receptors, OVA-specific Thy1.2+ Th1 cells were generated in vitro from Thy1.2+ OTII mice, which are transgenic for the TCR recognizing pOVA323–39, are congenic for the Thy1.2 allele and are in the C57BL/6 background. With the exception of studies using STAT1−/− mice, which are in the BALB/c background, we used mice in the C57BL/6 background for the remainder of our studies because our chemokine receptor deficient mice are in the C57BL/6 background. OVA-specific Th1 cells were generated in vitro using pOVA323–339, IL-12, and anti-IL-4. On day 5, one-half of the cells were treated overnight with PTX and one half of the cells were treated with vehicle. PTX treatment did not affect the viability, proliferation, differentiation, and activation of OVA-specific Th1 cells, which were shown to produce IFN-γ, and not IL-4 or IL-17 (data not shown). PTX-treated and untreated OVA-specific Th1 cells were washed twice and transferred via the tail vein into separate recipient Thy1.1+ mice on day 6. Mice were given LPS (5 μg in 50ul of PBS) intranasally once followed by three daily aerosolized OVA challenges (Th1 + LPS + OVA). Twenty-four hours after the last OVA challenge, BAL, lung, and spleen were harvested and OVA-specific cells were identified as Thy1.2+CD4+ cells. There was a dramatic decrease in the trafficking of OVA-specific Th1 cells into the BAL (600-fold) and the lung (17-fold) after PTX treatment (Fig. 2⇓, a and b). There was no difference in the trafficking of OVA-specific Th1 cells into the spleen with PTX (data not shown). Ag-specific Th1 cell trafficking in the context of LPS depends on Gαi-coupled chemoattractant receptors and is associated with increased expression of CXCR3 and CCR5 ligands. Thy1.2+ OTII Th1 cells were either treated or untreated with PTX and adoptively transferred into separate recipient Thy1.1+ mice that were given LPS intranasally once followed by three daily OVA challenges (Th1 + LPS + OVA). Twenty-four hours after the last OVA challenge, the BAL and lung were harvested. Number of Ag-specific cells (Thy1.2+CD4+) in BAL (a) and lung (b). n = 6 in two separate experiments. *, p < 0.05. c, Diagram of the experimental design. C57BL/6 mice were given either one intranasal dose of LPS (LPS only), or OTII Th1 cells via the tail vein followed by two daily aerosolized OVA challenges (Th1 + OVA), or OTII Th1 cells via the tail vein + one intranasal dose of LPS followed by two daily aerosolized OVA challenges (Th1 + LPS + OVA). Twenty-four hours after the last OVA challenge, which was also 48 h after the dose of LPS, mice were evaluated. d, Lung chemokine mRNA expression levels 24 h after the second OVA challenge or 48 h after the dose of LPS in LPS only, Th1 + OVA and Th1 + LPS + OVA recipient mice. n = 6–9 in two separate experiments. *, p < 0.05; **, p < 0.005. e, CCL3 and CCL4 BAL protein levels 24 h after the second OVA challenge or 48 h after the dose of LPS in LPS only, Th1 + OVA and Th1 + LPS + OVA recipient mice. n = 6–7, in two separate experiments, *, p < 0.05; **, p < 0.005. We hypothesized that the differential regulation of Th1 cell trafficking in the context of LPS may be explained by a different pattern of chemokine expression in the lung when Ag is given with LPS. Our studies with PTX indicated that Ag-specific Th1 cell trafficking in the context of LPS continues to depend on Gαi-coupled chemoattractant receptors. However, Th1 cells traffic normally in STAT1−/− mice that do not express CXCL9, CXCL10, and CXCL11, demonstrating that in the context of LPS, there must exist other overlapping pathways for Th1 cell trafficking that make CXCR3 dispensable. Because CXCR3, CCR5, CXCR6, and CX3CR1 are expressed on Th1 cells (29, 30, 31), we compared the mRNA levels of the ligands for these chemokine receptors using QPCR in the lungs of mice that received LPS only, Th1 cells and OVA challenges, or Th1 cells + LPS and OVA challenges 24 h after the second OVA challenge. We chose this time point because it corresponds to the time of the third OVA challenge when a sharp increase in Th1 cell trafficking occurs. OVA-specific Th1 cells were generated in vitro from Thy1.1+ OTII cells as described above, were shown to produce IFN-γ, and not IL-4 or IL-17 (data not shown) and were used for adoptive transfer experiments. Thy1.2+ C57BL/6 recipient mice were divided into three groups (Fig. 2c⇑): the first group received only LPS (5 μg in 50ul of PBS) (LPS only). The second group received only OTII Th1 cells via the tail vein and PBS (50 μl) intranasally, followed by two daily aerosolized OVA challenges (Th1 + OVA). The third group received OTII Th1 cells via the tail vein + one intranasal dose of LPS (5 μg in 50 μl of PBS) followed by two aerosolized OVA challenges (Th1 + LPS + OVA). Lungs were harvested 24 h after the second OVA challenge. RNA was isolated and chemokine mRNA levels were measured using specific primers and QPCR. Levels of RNA for the CXCR3 ligands (CXCL9 and CXCL10) and CCR5 ligands (CCL5, CCL3 and CCL4) differed significantly between the groups (Fig. 2⇑d, right and left), while there was no difference in the levels of RNA for the CXCR6 ligand, CXCL16, and the CX3CR1 ligand, CX3CL1, in the lungs of LPS only, Th1 + OVA and Th1 + LPS + OVA recipient mice (data not shown). CXCL9 RNA levels were 4.2-fold higher in Th1 + LPS + OVA recipients, compared with LPS only recipients, while CXCL10 RNA levels were 2.6-fold and 1.8-fold higher in Th1 + LPS + OVA recipients compared with LPS only and Th1 + OVA recipients, respectively (Fig. 2⇑d, left). There was also a 2-fold increase in the CCL5 RNA levels in Th1 + LPS + OVA recipient mice compared with the other two groups (Fig. 2⇑d, left). CCL3 and CCL4 RNA levels in the lungs of Th1 + LPS + OVA recipients paralleled CCL3 and CCL4 expression levels in the lungs of LPS only recipients but were dramatically higher than CCL3 and CCL4 RNA levels in Th1 + OVA recipient mice (10-fold and 4-fold, respectively) (Fig. 2⇑d, right). Similarly, CCL3 and CCL4 protein levels were 3- to 4-fold higher in the BAL of Th1 + LPS + OVA recipients compared with Th1 + OVA recipients but paralleled CCL3 and CCL4 protein levels in LPS only recipient mice (Fig. 2⇑e). These data indicate that by the time of the third OVA challenge, many CXCR3 and CCR5 ligands are more highly expressed in the lungs of Th1 + LPS + OVA recipients compared with Th1 + OVA recipient mice. The increased levels of CXCL10, CCL5, CCL3, and CCL4 likely account for the increased trafficking of Ag-specific Th1 cells when Ag encounter occurs in the context of LPS. Furthermore, abundant expression of CCL5, CCL3, and CCL4 in Th1 + LPS + OVA recipients could explain why CXCR3 and its ligands are dispensable for Th1 cell trafficking in the context of LPS. The increased levels of CXCL10, CCL5, CCL3, and CCL4 in Th1 + LPS + OVA recipient mice compared with Th1 + OVA recipients implicated these chemokines in the regulation of Th1 cell trafficking in the context of LPS. Because CXCR3, the chemokine receptor for CXCL9, CXCL10, and CXCL11, and CCR5, the chemokine receptor for CCL5, CCL3, and CCL4, are preferentially expressed on Th1 cells (29, 30), we investigated the relative contribution of these chemokine receptors to the trafficking of Ag-specific Th1 cells when Ag exposure occurs in the context of LPS. OVA-specific Th1 cells were generated in vitro as described above from Thy1.2+ OTII cells and Thy1.2+ OTII cells that were deficient in CCR5, CXCR3, and both CCR5 and CXCR3. After 6 days of culture, cells were shown to generate similar levels of IFN-γ, thus having differentiated equally to a Th1 phenotype (supplementary Fig. 1⇑b). The cells were adoptively transferred into separate Thy1.1+ C57BL/6 mice. The recipient mice were given one dose of LPS (5 μg per 50ul of PBS) intranasally followed by two or three daily, aerosolized OVA challenges. Twenty-four hours after the last challenge, lung and BAL were harvested and the number of OVA-specific Th1 cells was determined in each group as CD4+ Thy1.2+ cells. After two OVA challenges, both CXCR3 and CCR5 were required for efficient trafficking of OVA-specific Th1 cells into the airways as single deficiency in either CXCR3 or CCR5 resulted in a partial trafficking defect (Fig. 3⇓a). 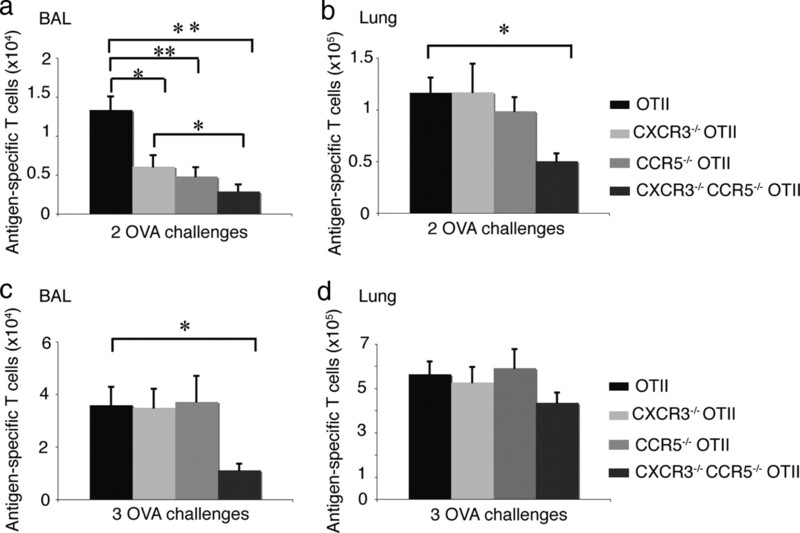 The number of CXCR3−/− OTII, CCR5−/− OTII, and CXCR3−/−CCR5−/− OTII Th1 cells that trafficked into the airways after two OVA challenges was 2.2-, 2.8-, and 4.5-fold lower, respectively, compared with the number of OTII Th1 cells. Trafficking of OVA-specific Th1 cells into the lung after two OVA challenges required either CXCR3 or CCR5 as OTII Th1 cells that lacked either CXCR3 or CCR5 trafficked normally into the lung, but OTII Th1 cells that lacked both CXCR3 and CCR5 had a 2.3-fold trafficking defect (Fig. 3⇓b). After three OVA challenges, trafficking of OVA-specific Th1 cells became less dependent on any one chemokine receptor. Although OVA-specific Th1 cell trafficking into the airways was decreased 3-fold when OTII cells were deficient in both CXCR3 and CCR5 (Fig. 3⇓c), there was normal trafficking of OVA-specific Th1 cells into the lung after three OVA challenges even in the absence of both CXCR3 and CCR5 (Fig. 3⇓d). The dispensability of CXCR3 after three OVA challenges is consistent with our observation that STAT1−/− mice recruit Ag-specific Th1 cells normally at this time point despite lack of CXCR3 ligands. These findings collectively demonstrate that when Ag encounter occurs in the context of LPS, Ag-specific Th1 cell trafficking is preserved through multiple overlapping chemoattractant pathways. Contribution of CXCR3 and CCR5 to Ag-specific Th1 cell trafficking following Ag exposure in the context of LPS. Thy1.2+ OTII and chemokine receptor deficient Thy1.2+ OTII Th1 cells were adoptively transferred into separate Thy1.1+ C57BL/6 mice. The recipient mice were given one dose of LPS intranasally followed by two or three daily aerosolized OVA challenges. Twenty-four hours after the last challenge, the lung and the BAL were harvested and number of Ag-specific cells (CD4+Thy1.2+) was determined. a, BAL after two OVA challenges. b, Lung after two OVA challenges. c, BAL after three OVA challenges. d, Lung after three OVA challenges. n = 9 in three separate experiments. *, p < 0.05; **, p < 0.005. We next asked whether the increased trafficking of Ag-specific Th1 cells into the airway, observed when Ag exposure occurs in the context of LPS, affects clinical manifestations, airway, or pulmonary inflammation. OVA-specific Th1 cells were generated in vitro from Thy1.1+ OTII cells as described above, were shown to produce IFN-γ and not IL-4 or IL-17 (data not shown), and were used for adoptive transfer experiments. Thy1.2+ C57BL/6 recipient mice were divided into three groups (Fig. 4⇓a): the first group (LPS only) received only LPS (5 μg in 50ul of PBS). The second group (Th1 + OVA) received only OTII Th1 cells via the tail vein followed by three daily aerosolized OVA challenges. The third group (Th1 + LPS + OVA) received OTII Th1 cells via the tail vein + one intranasal dose of LPS (5 μg in 50 μl of PBS) followed by three daily, aerosolized OVA challenges. Twenty-four hours after the third OVA challenge, which was also 72 h after the dose of LPS, mice were scored clinically. An observer blinded to the treatment groups performed clinical scoring from 0 (absent) to 3 (severe) based on chills, hunched posture, lethargy, and piloerection. Mice were then euthanized, BAL was harvested and total cell count and differential were determined in cytocentrifuged samples. In addition, lungs were harvested for H&E histologic staining. Endotoxin augmented Ag-induced Th1 cell trafficking amplifies airway neutrophilic inflammation. a, Diagram of the experimental design. C57BL/6 mice were given either one intranasal dose of LPS (LPS only), or OTII Th1 cells via the tail vein followed by three daily aerosolized OVA challenges (Th1 + OVA), or OTII Th1 cells via the tail vein + one intranasal dose of LPS followed by three daily aerosolized OVA challenges (Th1 + LPS + OVA). Twenty-four hours after the last OVA challenge, which was also 72 h after the dose of LPS, mice were evaluated. b, Comparison of clinical score. n = 8–9 in two separate experiments. **, p < 0.005; ***, p < 0.0005. c, Comparison of survival. n = 12–24. d, BAL total cell count and differential. n = 10–13 mice in three separate experiments. *, p < 0.05. e, H&E staining of the lung. Similar to BALB/c mice (Fig. 1⇑a), we observed that C57BL/6 mice that received Th1 + LPS + OVA recruited more OVA-specific T cells into the airway compared with Th1 + OVA recipients (data not shown). Th1 + LPS + OVA recipients appeared more ill than LPS only and Th1 + OVA recipients. The clinical score of mice in the LPS only group 72 h after the dose of LPS was 0.16 ± 0.07. The clinical score of mice in the Th1 + OVA group after three daily OVA challenges was 0.64 ± 0.12, while the clinical score of mice in the Th1 + LPS + OVA group after three daily OVA challenges was 2.44 ± 0.13 (Fig. 4⇑b). Furthermore, when LPS dose was increased to 10–20 μg in 50ul of PBS, 38% of Th1 + LPS + OVA recipient mice died after three daily OVA challenges while there was no mortality in LPS only and Th1 + OVA recipient mice (Fig. 4⇑c). The BAL total cell count and neutrophil count were markedly higher in the Th1 + LPS + OVA group compared with the other two groups. The number of BAL neutrophils in Th1 + LPS + OVA recipients after three OVA challenges was 6.5-fold higher than Th1 + OVA recipients, and 3-fold higher than LPS only recipients (Fig. 4⇑d). H&E staining revealed more inflammation in the lungs of Th1 + LPS + OVA recipients after three OVA challenges compared with the other two groups (Fig. 4⇑e). To better understand the synergistic effect of LPS and Ag-induced Th1 cell trafficking on neutrophilic inflammation, we performed a kinetic analysis and compared BAL neutrophilia in cytocentrifuged samples at different time points after OVA challenges and/or LPS. OVA-specific Th1 cells were generated in vitro from Thy1.1+ OTII cells as described above, were shown to produce IFN-γ and not IL-4 or IL-17 (data not shown), and were used for adoptive transfer experiments. Thy1.2+ C57BL/6 recipient mice were divided into three groups: the first group (LPS only) received only LPS (5 μg in 50ul of PBS). The second group (Th1 + OVA) received only OTII Th1 cells via the tail vein followed by one, two, or three daily, aerosolized OVA challenges. The third group (Th1 + LPS + OVA) received OTII Th1 cells via the tail vein + one intranasal dose of LPS (5 μg in 50 μl of PBS) followed by one, two, or three daily, aerosolized OVA challenges. Twenty-four hours after the first, second, and third OVA challenge, which corresponds to 24, 48, and 72 h after the dose of LPS, BAL and lungs were harvested. Consistent with the published literature (32, 33, 34), LPS-only recipient mice responded to LPS by a sharp increase in BAL neutrophilia that peaked by 24 h and declined rapidly by 72 h (Fig. 5⇓a). Th1 + OVA recipients showed a linear increase in BAL neutrophilia with additional OVA challenges (Fig. 5⇓a). Th1 + LPS + OVA recipient mice responded in parallel with LPS only recipient mice for the first 48 h. However, while neutrophilic infiltration decreased sharply in LPS-only recipients after 48 h, Th1 + LPS + OVA recipients showed persistent BAL neutrophilia (Fig. 5⇓a). Ly6G staining of BAL cells and flow cytometry analysis confirmed the persistent neutrophilia observed in cytocentrifuged samples of Th1 + LPS + OVA recipient mice 24 h after the third OVA challenge (Fig. 5⇓b). Of note, there was no difference in the number of BAL neutrophils at different time points in mice that were given an intranasal dose of LPS (5 μg in 50ul of PBS) with and without OVA challenges, without any adoptive transfer of Ag-specific Th1 cells (supplementary Fig. 1⇑c). Ag-activated Th1 cells sustain neutrophilic inflammation initiated by LPS. a, Number of neutrophils in the BAL after one, two, or three aerosolized OVA challenges (nebs), corresponding to 24, 48, and 72 h after the dose of LPS, respectively, in LPS only, Th1 + OVA, and Th1 + LPS + OVA recipient mice. n = 7–13 in two to three separate experiments. *, p < 0.05 Th1 + LPS + OVA vs LPS only and Th1 + LPS + OVA vs Th1 + OVA. #, p < 0.005 Th1 + OVA vs Th1 + LPS + OVA and Th1 + OVA vs LPS only. b, Number of Ly6G+ cells in the BAL 24 h after the third OVA challenge or 72 h after the dose of LPS. n = 6–9 in two separate experiments. *, p < 0.05. c and d, Lung mRNA expression of KC and MIP-2, 24 h after the second and third OVA challenge (2 nebs and 3 nebs) or 48 and 72 h after the dose of LPS, respectively. n = 6–9 in two separate experiments for 2 nebs. n = 10–13 in three separate experiments for 3 nebs. *, p < 0.05; **, p < 0.005; ***, p < 0.0005. e, BAL KC protein levels 24 h after the third OVA challenge (3 nebs) or 72 h after the dose of LPS. n = 14–22 in four separate experiments. *, p < 0.05. To explain the persistent neutrophilia in mice that received Th1 + LPS + OVA, we compared mRNA levels of the neutrophil-active chemokines, CXCR2 ligands KC and MIP-2, in the three groups. We found that after two OVA challenges, which was also 48 h after the dose of LPS, the expression of KC and MIP-2 in the lungs of Th1 + LPS + OVA recipients paralleled the expression of KC and MIP-2 in the lungs of LPS only recipients (Fig. 5⇑, c and d, 2 nebulizations (nebs)). However, after three OVA challenges, which was also 72 h after the LPS dose, the expression of KC and MIP-2 in Th1 + LPS + OVA recipients was 22- and 13-fold, respectively, higher than KC and MIP-2 levels in LPS only recipients (Fig. 5⇑, c and d, 3 nebs). KC and MIP-2 expression was lower in Th1 + OVA recipients compared with Th1 + LPS + OVA recipients at both time points (Fig. 5⇑, c and d). We confirmed the mRNA pattern described above with protein levels for KC. Consistent with mRNA levels, KC protein levels were 3.2-fold higher in Th1 + LPS + OVA recipients compared LPS only recipients after three OVA challenges or 72 h after the dose of LPS (Fig. 5⇑e). Therefore, Th1 + LPS + OVA recipients paralleled LPS only recipients in KC expression, MIP-2 expression, and neutrophil levels for the first 48 h. However, while LPS only recipients showed a sharp drop in these parameters by 72 h, Th1 + LPS + OVA recipients maintained their high KC and MIP-2 expression and high BAL neutrophilia. We have shown that Ag-induced Th1 cell trafficking in the context of LPS maintains high KC and MIP-2 expression levels. To determine whether this sustained expression of KC and MIP-2 in Th1 + LPS + OVA recipients is the result of IFN-γ released from Th1 cells, we used STAT1−/− mice as recipients, which are IFN-γ unresponsive (12). DO11.10 Th1 cells were generated in vitro as previously described. WT and STAT1−/− mice, both in the BALB/c background, were divided into three groups: one group received only one intranasal dose of LPS (LPS only), the second group received only DO11.10 Th1 cells via the tail vein followed by three daily aerosolized 5% OVA challenges (Th1 + OVA), and the third group received DO11.10 Th1 cells and an intranasal dose of LPS followed by three daily aerosolized 5% OVA challenges (Th1 + LPS + OVA). Twenty-four hours after the last OVA challenge, which was also 72 h after the dose of LPS, lungs were harvested and KC and MIP-2 expression levels were measured. Similar to WT C57BL/6 mice, WT BALB/c mice showed higher KC and MIP-2 expression levels in Th1 + LPS + OVA recipients compared with LPS only and Th1 + OVA-recipient mice (Fig. 6⇓a, left). However, in STAT1−/− mice, there was no difference in KC and MIP-2 mRNA levels between Th1 + LPS + OVA recipients and LPS only or Th1 + OVA recipient mice (Fig. 6⇓a, right). Ag-activated Th1 cells sustain neutrophilic inflammation through IFN-γ. a, KC and MIP-2 mRNA expression in WT mice (STAT1+/+, left panel) and STAT1−/− mice (right panel) that were given LPS only, Th1 + OVA or Th1 + LPS + OVA 24 h after the third OVA challenge or 72 h after the dose of LPS. n = 9–10 in three separate experiments. *, p < 0.05 and **, p < 0.005. b, Number of BAL neutrophils in WT and STAT1−/− mice that were given LPS only, Th1 + OVA, Th1 + LPS or Th1 + LPS + OVA 24 h after the third OVA challenge or 72 h after the dose of LPS. n = 6–13 mice in two to three separate experiments. *, p < 0.05; **, p < 0.005; ***, p < 0.0005. c, Clinical score of WT and STAT1−/− mice that were given LPS only, Th1 + OVA, Th1 + LPS or Th1 + LPS + OVA 24 h after the third OVA challenge or 72 h after the dose of LPS. n = 6–18 in two to three separate experiments. *, p < 0.05; ***, p < 0.0005. d, OTII Th1 cells were adoptively transferred into WT and IFN-γR1−/− mice that were given one intranasal dose of LPS followed by three aerosolized OVA challenges (Th1 + LPS + OVA). Twenty-four hours after the last OVA challenge, the BAL was harvested and the number of neutrophils was determined. n = 6–10 in two separate experiments. *, p < 0.05. e, Clinical score of WT and IFN-γR1−/− mice that were given Th1 + LPS + OVA 24 h after the third OVA challenge. n = 6–10 in two separate experiments. ***, p < 0.0005. The lower KC and MIP-2 mRNA levels in STAT1−/− Th1 + LPS + OVA recipients correlated with lower levels of BAL neutrophilia such that STAT1−/− Th1 + LPS + OVA recipients had 50% lower BAL neutrophilia compared with WT Th1 + LPS + OVA recipients (Fig. 6⇑b). Similarly, the clinical score of STAT1−/− Th1 + LPS + OVA recipients was 3.6-fold lower than the clinical score of WT Th1 + LPS + OVA recipients (Fig. 6⇑c). Of note, we also compared BAL neutrophilia and clinical scores in mice that received DO11.10 Th1 cells and an intranasal dose of LPS (5 μg in 50ul of PBS) with (Th1 + LPS + OVA) and without (Th1 + LPS) OVA challenges. BAL neutrophilia was 6.7-fold higher in WT Th1 + LPS + OVA recipients compared with WT Th1 + LPS recipients (Fig. 6⇑b). Clinical score was 3.4-fold higher in WT Th1 + LPS + OVA recipients compared with WT Th1 + LPS recipients (Fig. 6⇑c), providing further support that it is the Ag-activated Th1 cells that lead to amplified airway neutrophilic inflammation and more severe clinical disease. Finally, we examined whether the lower BAL neutrophilia and clinical scores observed in STAT1−/− mice, which are IFN-γ unresponsive, would be corroborated in IFN-γR1−/− mice. OTII Th1 cells were generated in vitro as previously described and transferred into WT and IFN-γR1−/− (both in the C57BL/6 background). All mice were given an intranasal dose of LPS (5 μg in 50ul of PBS) followed by three daily OVA challenges (Th1 + LPS + OVA). Twenty-four hours after the last OVA challenge, clinical scores were assigned, BAL was obtained and BAL neutrophils were identified by Ly6G staining. The number of BAL neutrophils was reduced by 49% in IFN-γR1−/− mice compared with WT mice (Fig. 6⇑d). In addition, the clinical score of IFN-γR1−/− mice was 9-fold lower than the clinical score of WT mice (Fig. 6e⇑). 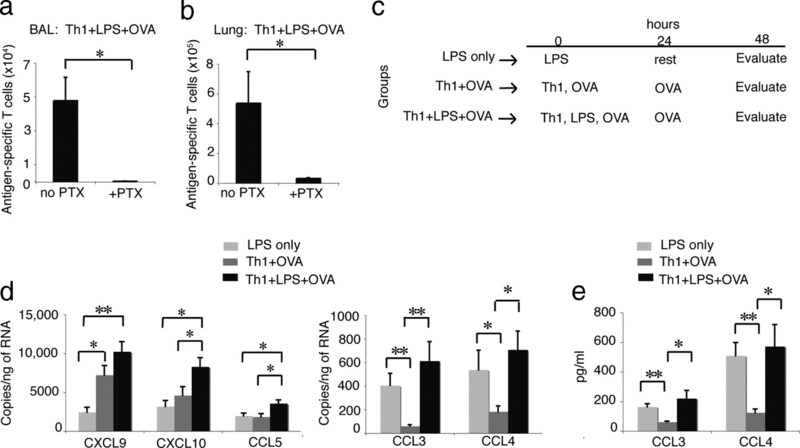 These data collectively suggest that Ag-activated Th1 cells amplify the LPS-induced airway neutrophilic infiltration by maintaining high levels of neutrophil-active CXCR2 ligands, KC and MIP-2, through an IFN-γ dependent mechanism. We have previously shown that Th1 cell trafficking into the lung is controlled in large part by CXCR3 expressed on Th1 cells and STAT1-inducible CXCR3 ligands in the lung as STAT1−/− mice that do not express CXCL9, CXCL10, and CXCL11 fail to efficiently recruit Ag-specific Th1 cells into the lung and the airways following airway Ag challenges (24). In this study, we demonstrate that LPS increases the magnitude and alters the mechanism of Th1 cell trafficking in vivo. STAT1−/− mice that received an intranasal dose of LPS were able to recruit Ag-specific Th1 cells normally into the lung and the airways after airway Ag challenges despite lack of CXCR3 ligands. This indicates the presence of CXCR3-independent pathways that preserve Ag-specific Th1 cell trafficking when Ag exposure occurs along with LPS exposure. Ag-specific Th1 cell trafficking in the context of LPS continued to be PTX sensitive, thus reliant on Gαi-coupled chemoattractant receptors, and partially depended on CCR5. Levels of CXCR3, CCR1, and CCR5 ligands were increased in the lungs of mice that received Ag-specific Th1 cells and LPS followed by Ag challenges compared with mice that received Ag-specific Th1 cells and Ag without LPS, explaining both the increased trafficking of Th1 cells and the dispensability of any one chemokine receptor to Th1 cell trafficking in the context of LPS. The differential regulation of Ag-specific Th1 cell trafficking, whether or not Ag exposure occurs in the context of LPS, implies that it might be possible to therapeutically control the trafficking of Th1 cells in a setting of sterile inflammation without compromising Th1 cell immunity to infectious pathogens. Our study suggests that specifically inhibiting STAT1-regulated Th1 cell trafficking could be beneficial for Th1-mediated inflammatory diseases while leaving Th1 cell trafficking to sites of infection intact. The increased trafficking of Ag-specific Th1 cells into the airways in the context of LPS was associated with increased neutrophilic inflammation and more severe clinical symptom scores. This increased pathology required both LPS and Ag as Th1 + LPS recipient mice had significantly lower BAL neutrophilia and clinical score than Th1 + LPS + OVA recipient mice. We found that trafficking of Ag-activated Th1 cells in the context of LPS altered the kinetics of BAL neutrophilic inflammation. Th1 + OVA recipient mice had a relatively modest linear increase in BAL neutrophilia with increasing OVA challenges while LPS only recipient mice had a brisk increase in BAL neutrophilia that peaked in 24 h and declined sharply by 72 h. Th1 + LPS + OVA recipient mice demonstrated a sharp increase in BAL neutrophils parallel to LPS only recipients for the first 48 h. However, unlike LPS only recipients, Th1 + LPS + OVA recipient mice maintained high neutrophil numbers in the airways 72 h after the dose of LPS. Similarly, while KC and MIP-2 levels dropped sharply in LPS only recipients by 72 h, Th1 + LPS + OVA recipient mice maintained high KC and MIP-2 levels. We found that the higher KC and MIP-2 levels and BAL neutrophilia in Th1 + LPS + OVA recipients was dependent on IFN-γ signaling as STAT1−/− mice failed to maintain high KC and MIP-2 levels and BAL neutrophilia in Th1 + LPS + OVA recipients 72 h after the dose of LPS. This diminished BAL neutrophilia was also observed in IFN-γR1−/− Th1 + LPS + OVA recipient mice. Inability to respond to IFN-γ protected both STAT1−/− and IFN-γR1−/− mice against clinical disease as these mice had significantly lower clinical severity scores. Other studies have demonstrated that IFN-γ decreases neutrophil apoptosis, a phenomenon that may also contribute to the increased neutrophilia in Th1 + LPS + OVA recipient mice (2, 35). Our findings are consistent with a report that used TLR4−/− mice to implicate endotoxin contamination in commercial OVA preparations in augmenting T cell recruitment into the airway after the cotransfer of Th2 and Th1 cells (36). In our study, we explored the effect of endotoxin on both the magnitude and the mechanism of Th1 cell trafficking without the confounding effect of Th2 cells. Our observations also agree with the report that wild-type mice infected Bacillus Calmette-Guerin, but not IFN-γR−/− Bacillus Calmette-Guerin infected mice, are more sensitive to LPS induced endotoxic shock (15) and another report that intratracheal inoculation of rats with an adenoviral vector encoding murine IFN-γ enhances clearance of Pseudomonas aeroginosa (37). Many studies have shown that LPS exposure results in LPS tolerance and TLR4 down-regulation such that the host becomes less responsive to subsequent doses of LPS (38, 39, 40). In this study, we demonstrate that Ag-activated Th1 cells are able to maintain the neutrophilic inflammation initiated by LPS, thus sustaining the neutrophilic line of defense in the absence of further LPS encounter or recognition. The published literature draws attention to the complimentary roles of Th1 and Th17 cells in host defense against Gram-negative pathogens. For example, lung infection with Pseudomonas aeroginosa, an extracellular Gram-negative bacteria and a significant cause of lung infection and morbidity in patients with cystic fibrosis, is associated with increases in both BAL IL-17 and IFN-γ levels (41). Furthermore, survival against Klebsiella pneumoniae, another extracellular Gram-negative bacteria, depends on both Th1 and Th17 cells. In a mouse model of Klebsiella pneumoniae, IL-12 p35−/− mice, which have diminished IFN-γ production, and IL-23 p19−/− mice, which lack IL-17 production, show a similar partial decrease in survival rates while there is 100% mortality in IL-12/IL-23 p40−/− mice, which are deficient in both IFN-γ and IL-17 (42). 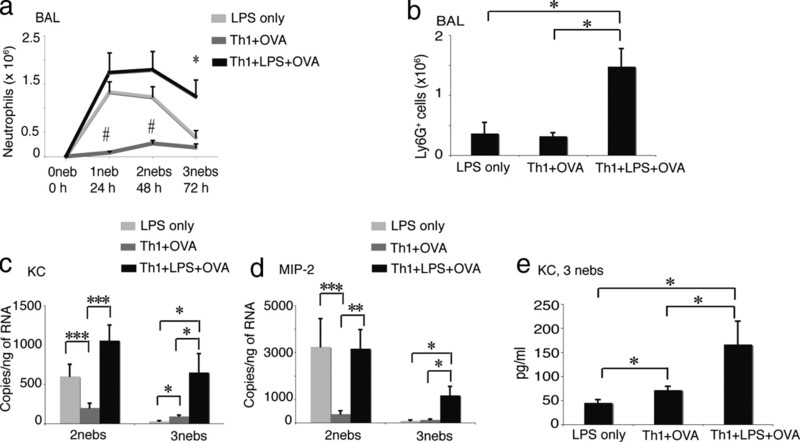 Further support for the overlapping roles of Th1 and Th17 cells is provided by the observation that IL-12/1L-23 p40−/− mice are more susceptible to Salmonella and mycobacterial infections than IL-12 p35−/− mice (43, 44). Our study defines how LPS impacts both the magnitude and the mechanism of Th1 cell trafficking in vivo and supports the literature on the role of Th1 cells in host defense against Gram-negative bacterial infections. In summary, we have demonstrated that LPS increases the trafficking of Ag-specific Th1 cells into the airways and overrides the STAT1 dependence of Th1 cell trafficking in vivo. In the context of LPS, Ag-specific Th1 cell trafficking is ensured through overlapping Gαi-coupled chemoattractant receptor pathways, thus guaranteeing the arrival of Th1 cells at the site of LPS exposure as seen during Gram-negative bacterial invasion. Arrival of Ag-activated Th1 cells, in turn, maintains the tissue neutrophil-active chemokine milieu created by LPS and sustains the neutrophilic line of defense. This synergism between LPS and Ag-activated Th1 cells illustrates another collaboration between the innate and adaptive arms of the immune system to ensure a robust and sustained immune response. We thank Dr. David Levy for STAT1−/− mice and Drs. Craig Gerard and Bao Lu for CXCR3−/− mice. 1 This work was supported by the National Institute of Health (R37-AI40618 to A.D.L. and K08AI67519 to Z.M.). 3 Abbreviations used in this paper: PTX, pertussis toxin; BAL, bronchoalveolar lavage; TLN, thoracic lymph node; QPCR, quantitative PCR; WT, wild type; Neb, nebulization. Dibbert, B., M. Weber, W. H. Nikolaizik, P. Vogt, M. H. Schoni, K. Blaser, H. U. Simon. 1999. Cytokine-mediated Bax deficiency and consequent delayed neutrophil apoptosis: a general mechanism to accumulate effector cells in inflammation. Proc. Natl. Acad. Sci. USA 96: 13330-13335. Dorman, S. E., G. Uzel, J. Roesler, J. S. Bradley, J. Bastian, G. Billman, S. King, A. Filie, J. Schermerhorn, S. M. Holland. 1999. Viral infections in interferon-γ receptor deficiency. J. Pediatr. 135: 640-643. Altare, F., D. Lammas, P. Revy, E. Jouanguy, R. Doffinger, S. Lamhamedi, P. Drysdale, D. Scheel-Toellner, J. Girdlestone, P. Darbyshire, et al 1998. Inherited interleukin 12 deficiency in a child with bacille Calmette-Guerin and Salmonella enteritidis disseminated infection. J. Clin. Invest. 102: 2035-2040. Lu, B., C. Ebensperger, Z. Dembic, Y. Wang, M. Kvatyuk, T. Lu, R. L. Coffman, S. Pestka, P. B. Rothman. 1998. Targeted disruption of the interferon-γ receptor 2 gene results in severe immune defects in mice. Proc. Natl. Acad. Sci. USA 95: 8233-8238. Flynn, J. L., J. Chan, K. J. Triebold, D. K. Dalton, T. A. Stewart, B. R. Bloom. 1993. An essential role for interferon γ in resistance to Mycobacterium tuberculosis infection. J. Exp. Med. 178: 2249-2254. Suzuki, Y., F. K. Conley, J. S. Remington. 1989. Importance of endogenous IFN-γ for prevention of toxoplasmic encephalitis in mice. J. Immunol. 143: 2045-2050.
de Jong, R., F. Altare, I. A. Haagen, D. G. Elferink, T. Boer, P. J. van Breda Vriesman, P. J. Kabel, J. M. Draaisma, J. T. van Dissel, F. P. Kroon, et al 1998. Severe mycobacterial and Salmonella infections in interleukin-12 receptor-deficient patients. Science 280: 1435-1438. Picard, C., C. Fieschi, F. Altare, S. Al-Jumaah, S. Al-Hajjar, J. Feinberg, S. Dupuis, C. Soudais, I. Z. Al-Mohsen, E. Genin, et al 2002. Inherited interleukin-12 deficiency: IL12B genotype and clinical phenotype of 13 patients from six kindreds. Am. J. Hum. Genet. 70: 336-348. Kamijo, R., J. Le, D. Shapiro, E. A. Havell, S. Huang, M. Aguet, M. Bosland, J. Vilcek. 1993. Mice that lack the interferon-γ receptor have profoundly altered responses to infection with Bacillus Calmette-Guerin and subsequent challenge with lipopolysaccharide. J. Exp. Med. 178: 1435-1440. Dalton, D. K., S. Pitts-Meek, S. Keshav, I. S. Figari, A. Bradley, T. A. Stewart. 1993. Multiple defects of immune cell function in mice with disrupted interferon-γ genes. Science 259: 1739-1742. Newport, M. J., C. M. Huxley, S. Huston, C. M. Hawrylowicz, B. A. Oostra, R. Williamson, M. Levin. 1996. A mutation in the interferon-γ-receptor gene and susceptibility to mycobacterial infection. N. Engl. J. Med. 335: 1941-1949. Jouanguy, E., F. Altare, S. Lamhamedi, P. Revy, J. F. Emile, M. Newport, M. Levin, S. Blanche, E. Seboun, A. Fischer, J. L. Casanova. 1996. Interferon-γ-receptor deficiency in an infant with fatal bacille Calmette-Guerin infection. N. Engl. J. Med. 335: 1956-1961. Jouanguy, E., S. Lamhamedi-Cherradi, D. Lammas, S. E. Dorman, M. C. Fondaneche, S. Dupuis, R. Doffinger, F. Altare, J. Girdlestone, J. F. Emile, et al 1999. A human IFNGR1 small deletion hotspot associated with dominant susceptibility to mycobacterial infection. Nat. Genet. 21: 370-378. Pierre-Audigier, C., E. Jouanguy, S. Lamhamedi, F. Altare, J. Rauzier, V. Vincent, D. Canioni, J. F. Emile, A. Fischer, S. Blanche, et al 1997. Fatal disseminated Mycobacterium smegmatis infection in a child with inherited interferon γ receptor deficiency. Clin. Infect. Dis. 24: 982-984. Lowes, M. A., A. M. Bowcock, J. G. Krueger. 2007. Pathogenesis and therapy of psoriasis. Nature 445: 866-873. Chen, X., S. Vodanovic-Jankovic, B. Johnson, M. Keller, R. Komorowski, W. R. Drobyski. 2007. Absence of regulatory T-cell control of TH1 and TH17 cells is responsible for the autoimmune-mediated pathology in chronic graft-versus-host disease. Blood 110: 3804-3813. Tellides, G., J. S. Pober. 2007. Interferon-γ axis in graft arteriosclerosis. Circ. Res. 100: 622-632. Mikhak, Z., C. M. Fleming, B. D. Medoff, S. Y. Thomas, A. M. Tager, G. S. Campanella, A. D. Luster. 2006. STAT1 in peripheral tissue differentially regulates homing of antigen-specific Th1 and Th2 cells. J. Immunol. 176: 4959-4967. Hancock, W. W., B. Lu, W. Gao, V. Csizmadia, K. Faia, J. A. King, S. T. Smiley, M. Ling, N. P. Gerard, C. Gerard. 2000. Requirement of the chemokine receptor CXCR3 for acute allograft rejection. J. Exp. Med. 192: 1515-1520. Kuziel, W. A., T. C. Dawson, M. Quinones, E. Garavito, G. Chenaux, S. S. Ahuja, R. L. Reddick, N. Maeda. 2003. CCR5 deficiency is not protective in the early stages of atherogenesis in apoE knockout mice. Atherosclerosis 167: 25-32. Means, T. K., F. Hayashi, K. D. Smith, A. Aderem, A. D. Luster. 2003. The Toll-like receptor 5 stimulus bacterial flagellin induces maturation and chemokine production in human dendritic cells. J. Immunol. 170: 5165-5175. MacLean, J. A., R. Ownbey, A. D. Luster. 1996. T cell-dependent regulation of eotaxin in antigen-induced pulmonary eosinophila. J. Exp. Med. 184: 1461-1469. Bonecchi, R., G. Bianchi, P. P. Bordignon, D. D'Ambrosio, R. Lang, A. Borsatti, S. Sozzani, P. Allavena, P. A. Gray, A. Mantovani, F. Sinigaglia. 1998. Differential expression of chemokine receptors and chemotactic responsiveness of type 1 T helper cells (Th1s) and Th2s. J. Exp. Med. 187: 129-134. Sallusto, F., D. Lenig, C. R. Mackay, A. Lanzavecchia. 1998. Flexible programs of chemokine receptor expression on human polarized T helper 1 and 2 lymphocytes. J. Exp. Med. 187: 875-883. Fraticelli, P., M. Sironi, G. Bianchi, D. D'Ambrosio, C. Albanesi, A. Stoppacciaro, M. Chieppa, P. Allavena, L. Ruco, G. Girolomoni, F. Sinigaglia, A. Vecchi, A. Mantovani. 2001. Fractalkine (CX3CL1) as an amplification circuit of polarized Th1 responses. J. Clin. Invest. 107: 1173-1181. Noulin, N., V. F. Quesniaux, S. Schnyder-Candrian, B. Schnyder, I. Maillet, T. Robert, B. B. Vargaftig, B. Ryffel, I. Couillin. 2005. Both hemopoietic and resident cells are required for MyD88-dependent pulmonary inflammatory response to inhaled endotoxin. J. Immunol. 175: 6861-6869. Reutershan, J., A. Basit, E. V. Galkina, K. Ley. 2005. Sequential recruitment of neutrophils into lung and bronchoalveolar lavage fluid in LPS-induced acute lung injury. Am. J. Physiol. 289: L807-L815. Bozinovski, S., J. Jones, S. J. Beavitt, A. D. Cook, J. A. Hamilton, G. P. Anderson. 2004. Innate immune responses to LPS in mouse lung are suppressed and reversed by neutralization of GM-CSF via repression of TLR-4. Am. J. Physiol. 286: L877-L885. Colotta, F., F. Re, N. Polentarutti, S. Sozzani, A. Mantovani. 1992. Modulation of granulocyte survival and programmed cell death by cytokines and bacterial products. Blood 80: 2012-2020. Jung, Y. W., T. R. Schoeb, C. T. Weaver, D. D. Chaplin. 2006. Antigen and lipopolysaccharide play synergistic roles in the effector phase of airway inflammation in mice. Am. J. Pathol. 168: 1425-1434. Lei, D., J. R. Lancaster, Jr, M. S. Joshi, S. Nelson, D. Stoltz, G. J. Bagby, G. Odom, J. E. Shellito, J. K. Kolls. 1997. Activation of alveolar macrophages and lung host defenses using transfer of the interferon-γ gene. Am. J. Physiol. 272: L852-L859. Dubin, P. J., J. K. Kolls. 2007. IL-23 mediates inflammatory responses to mucoid Pseudomonas aeruginosa lung infection in mice. Am. J. Physiol. 292: L519-L528. Happel, K. I., P. J. Dubin, M. Zheng, N. Ghilardi, C. Lockhart, L. J. Quinton, A. R. Odden, J. E. Shellito, G. J. Bagby, S. Nelson, J. K. Kolls. 2005. Divergent roles of IL-23 and IL-12 in host defense against Klebsiella pneumoniae. J. Exp. Med. 202: 761-769. Lehmann, J., S. Bellmann, C. Werner, R. Schroder, N. Schutze, G. Alber. 2001. IL-12p40-dependent agonistic effects on the development of protective innate and adaptive immunity against Salmonella enteritidis. J. Immunol. 167: 5304-5315.
Cooper, A. M., A. Kipnis, J. Turner, J. Magram, J. Ferrante, I. M. Orme. 2002. Mice lacking bioactive IL-12 can generate protective, antigen-specific cellular responses to mycobacterial infection only if the IL-12 p40 subunit is present. J. Immunol. 168: 1322-1327.